A while back now I reviewed and was very impressed with the 2true colour drench lipgloss I won and somehow I've been lucky enough to win a 2true crystal lipgloss in their monthly website competition! All 2true products are £1.99 each or 3 for £4.99 so none of them break the bank! This time instead of a neutral shade I won a vivid pink glitter gloss. Since going blonde I've embraced pink lip shades but the most recent pink gloss I tried left me non-plussed. However once again I was pleasantly surprised with my 2true gloss! This product is definitely aimed at a younger audience with a smaller price bracket but that doesn't mean I don't recommend it for anybody else! The pigment in this adds a subtle tint and the glitter particles are delightfully multi-tonal. In the picture below you can really see this quite well! I was surprised to find a small brush instead of the usual lipgloss wand but I don't really mind it. The brush is small and easy to control and has really won me over. With some normal lipgloss wands I feel that they carry too much product whereas as the brush is so small this option offers you a little more control. The only problem I can find with this is that when I open the gloss, as the brush is narrow I have to be careful of excess product trying to come with it. Just open it slowly and dab off any excess and you'll be fine! 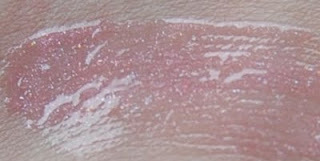 This gloss is shiny and sparkly without being overpowering. While you can definitely feel you are wearing it, it doesn't budge easily! I blotted mine and still could see the shine, tint and glitter. While it feels slightly tacky to the touch and when you press your lips together, I still think it wears rather well. I wouldn't advise anyone to apply it too liberally due to the tackiness but I'm very tempted to try it over some of my mini Benefit tints (from this month's Glamour magazine) to give it a little bit more impact. This gloss is really pretty and if you like sparkle I'd recommend it. Even if you don't like sparkle, the particles are small enough to be quite subtle! For £1.99 I'd be pleased to get such a pretty gloss with such a useful brush, but I think that my colour drench neutral gloss is still a little more wearable! I think I'll personally wear this in the evenings over a deeper tint or pink shade. Either way, it's a pretty shade with a delightful price tag. 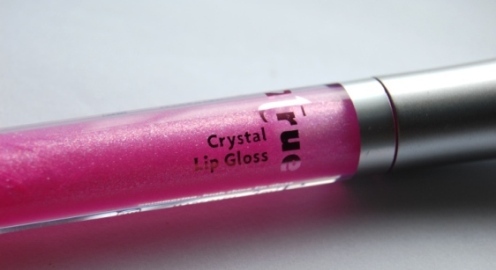 Very pretty gloss...what a bargain for £1.99! I've never actually tried any 2true products but this gloss looks sort of cute (if that makes sense?). @Aimee I can't wait to try it with some of my other products! @Miss A They're actually really worth a look! And I know what you mean, I think it's really well presented! @Catherine Glad you like it! I have used 2True lip gloss for years now, it's one of the best ones I've ever tried. I have Plumptuous number 6 but I'll have a look for this colour next time I'm stocking up, it's look really nice. @MagalufLady I have the colour drench one already and really love it! @Charlotte I might ahve signed up for the mailing list on 2 email accounts so maybe that was it? That or they just are very generous. Either way, it's well worth entering!